Fitzgerald River National Park in Western Australia is one of the largest and most botanically significant national parks in Australia, with approximately 15 per cent of the state’s described plant species. The park protects magnificent scenery and is one of the most flora-rich conservation areas in the state. We visited the park on our way from Esperance to Albany in August 2014. Although it was raining all day, we were stunned with the scenery: beautiful coastline, sand plains, rugged coastal hills and beautiful wildflowers…..
We took the Heritage Trail Drive (partly unsealed park road) for the scenic views and have not been disappointed. There are some stunning beaches (it was too early in August to swim), but we saw wildlife (kangaroos, whales and their calves from the shore at Barrens Beach lookout) and lots of wildflowers but no other cars or people. The rest of the way via Hammerlsey Inlet Rd (unsealed) looked liked this with lots of different types of wildflowers particulary everywhere. The park has recently undergone a major infrastructure upgrade that results in a superb tourist experience - beautifully designed and constructed roads, parking areas, interpretative signage, tracks, camping / caravan sites and ablution blocks. 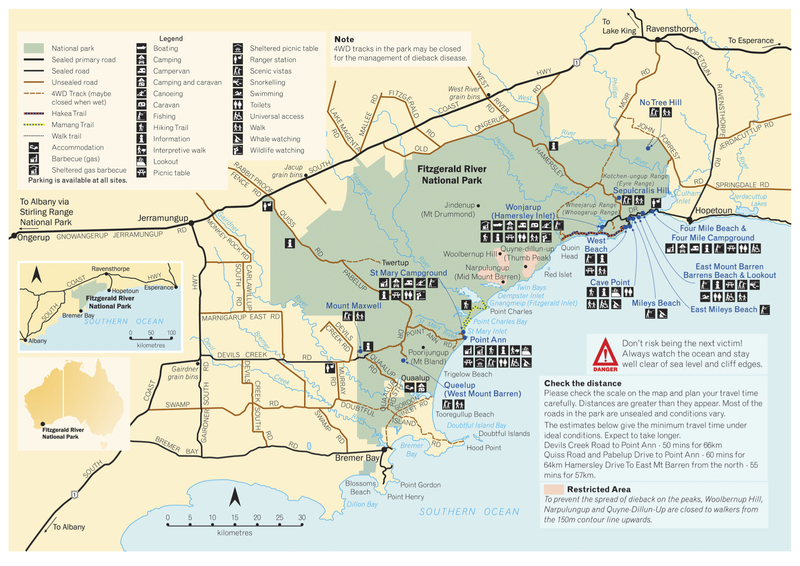 This was the best and most appropriate tourist development of a national park we have see, so Fitzgerald River National Park, see you sometime in the future!